Uncommonly used in most Chinese orchestral works, the Chinese banhu - also referred to as the qinhu, huhu, bangzihu or daxian - is typically used in Northern folk music, where it plays an important accompanying role in folk operas. In northwestern regions of China, the banhu is used as an accompanying instrument to xi qin qiang and bang zi qiang. Sizeably smaller than the erhu, the qintong (body) of the most traditional banhus are constructed from coconut shells or concave bamboo structures. The neck of the banhu is made out of solid rosewood, and its strings - similar to that of the erhu - have a qianjin, which gives the instrument its characteristic free string pitches. It is made complete with tuning pegs, strings, a bridge as well as horsetail hair bow. Variations of the banhu include: the soprano banhu, alto banhu and tenor banhu. 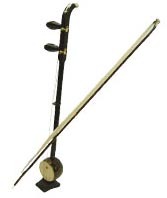 The soprano model is the type of banhu regularly used by the Chinese orchestra, due to its ability to produce extremely high pitches as compared to other bowed string instruments. Usually scored an octave lower, the notes produced by the alto banhu are milder and softer; its range and free strings are almost similar to that of the gaohu. As such, it is not often used in the Chinese orchestra. The timbre of the banhu is usually piercing and tinny; its range encapsulates the power and flavour of folk music. Performance techniques of the banhu is similar to that of the erhu. However, due to the nature of its short, tight strings and coarse-haired bow, the derived sound is different. Given its operatic background, string pressure techniques are usually favoured, so as to display its unique folk flavour. Want quality Banhus from a trusted source? Got a question? Drop us an enquiry below or send us a text at (65) 9754-3879.